Zoso Hotel Palm Springs on both days of the conference. 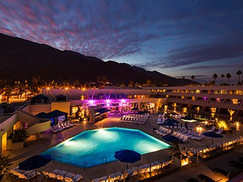 Complimentary shuttle service is provided by CMC-South on Friday and Saturday between the Hilton Resort, the Zoso Hotel Palm Springs and the Convention Center. The Renaissance, Hilton and Zoso Hotel reserve a limited number of rooms at special conference rates. If you experience any difficulty with this page please use the "Ask Us" feature on this website. At the bottom of this page there is a link to additional area hotels as listed on the Palm Springs Convention Center webpage. 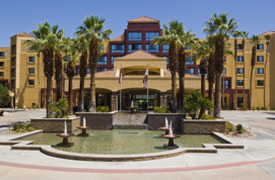 To reserve a hotel room at the Renaissance select the link below or call 888-682-1238 and notify the agent you are with the California Mathematics Council or CMC. The rates below apply through 10-15-19. 1 King bed or 2 queen beds. The Renaissance Hotel is attached to the Palm Springs Convention Center. Upon request, the Renaissance Palm Springs will provide complimentary shuttle service from the Palm Springs International Airport. Please call the hotel at (760) 322-6000 after you have picked up your luggage. To reserve a hotel room at the Hilton select the link below or call 800-445-8667. Use the code CMC or notifiy the agent your are with CMC. The rates below apply through 10-15-19. Prices listed above do not include taxes, utility fees and $22.00 optional daily resort fees (self parking and guest room internet upgrade are included in resort fees). Rates are based on a two night minimum stay. The Hilton also provides complimentary airport shuttle, 24-hour fitness center and a CMC discount at Elements Spa. The Hilton is located two blocks west of the Convention Center and Renaissance Hotel. 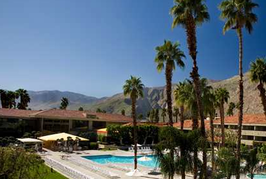 150 S Indian Canyon Dr.
To reserve a hotel room at the Zoso Hotel Palm Springs use a computer and select the link below. (The link does not work correctly with a mobile device.) Or make a reservation by calling 760-325-9676 and letting the agent know you are with CMC. The rates apply through 09-30-19 pending availability. Prices listed above do not include taxes and resort fees. The daily resort fee is $20.00 and will include the following hotel services: wireless internet access; fitness center access; pool access; unlimited local and 800-number calls; boarding pass printing; Airport Shuttle when available; and Valet Parking (one car per room night). Valet parking for non-guests is $16.00 overnight and $10.00 for day use. The Zoso Hotel is located four blocks west and one block south of the Convention Center/Renaissance Hotel.